Why is scuba diving is known as the safest adventure sport? Scuba Diving is one of the most popular water sports and is enjoyed by tourists of all age groups. From 8-year olds to the people in 60s (and even more than that depending on the health and fitness), everyone can do Scuba Diving in Kerala and enjoy the breathtaking beauty of the underwater world. Though the coastal areas and other places with water bodies that allow the visitors to enjoy the water sports have a lot of activities such as water biking, sofa riding, sea walking and diving etc. ; the adventure sport that is considered the best and the safest is scuba diving. For scuba diving, one doesn't need to be a swimmer; one doesn't need to know underwater breathing techniques and one doesn't have to even hold the breath for a single second. All that is to be done is putting on the scuba gear and breathe via the oxygen cylinder. The following post will comprise of a detailed overview of scuba as a water sport; threats and risks involved; reasons for its popularity and the things that make it the safest adventure sport. Having read the post, one will surely find oneself motivated enough to do the scuba diving without any hiccup. SCUBA stands for Self-Contained underwater breathing apparatus and allows people of all age groups to enjoy the breathtaking underwater wonderland. To enjoy scuba diving in Kerala, all you have to do is to put on a wetsuit that will keep your body warm under the water and wear the scuba gear that comprises of oxygen cylinders, mask for eyes and nose and weights around the waist that will keep you down the water. The scuba apparatus is designed such that you are able to breathe under the water easily via the mouth. A guide diver will deliver a training session of almost 10 minutes in which he or she will teach you the symbols for underwater communication, various techniques to deal with the pressure in the ears or water inside the nostrils etc; and then you will be taken under the water to witness the marvels of the sea. One doesn't have to be a swimmer to enjoy the scuba dive. The guide diver will be with you at all times and ensure that you are safe at all times. After having read all the "What's" about the scuba diving, let us find out why is it considered the safest adventure sport. Scuba Diving – Why the SAFEST water sport? As the scuba diving is done under the constant supervision of the guide diver, one doesn't have to be much concerned about the safety. The diver will ensure that you are ALWAYS safe and don't go in great depths or harsh currents that may pose any kind of threats. The diver will ensure that you make the most of your underwater adventure; witness every sight worth seeing and come back safely. 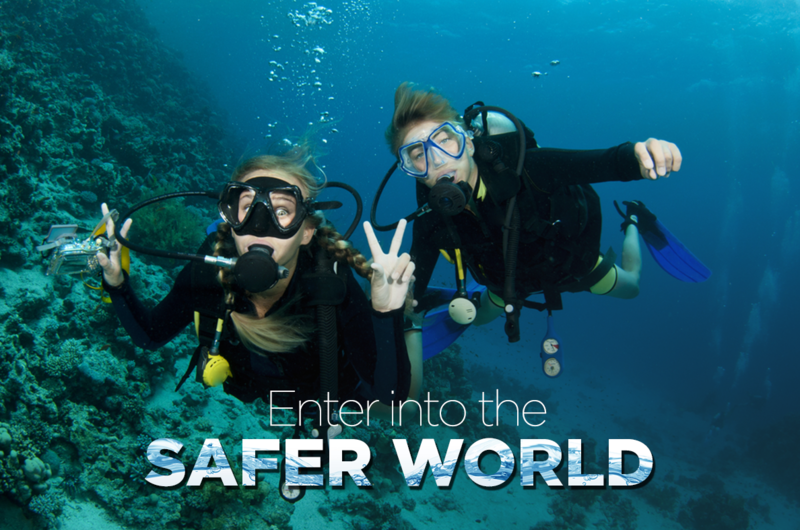 As you don't have to hold your breath while scuba diving, you can rest assured that you are safe. The oxygen cylinder comes with an easy breathing attachment so that your focus is always on the underwater sights and not on the breathing effort you have to put in. You can breathe as naturally as you do on the land and thus, the risk of dying due to the shortage of breath or any such reason is near to zero. Generally, the tourists doing scuba diving are not taken to very great depths; hence, the odds of dying are negligible. Even if a person gets tense or drops the oxygen pipe, the diver will bring you to the surface in a few seconds and ensure that you are safe in all situations. The divers that take you down the water for the scuba dive are well trained and certified. They are not only certified for scuba activities, they also specialize in dealing with the emergency situations that may arise during the underwater journey. They motivate you and help you in overcoming your fears, but they never push you to your limits and help you make the most of your time as per your abilities. Further, they show you everything present in the water such as corals, fishes, crabs, rocks and different types of creatures and flora. Buddy separation means separation of diving companions and is one of the causes of diving mishaps. But this happens only to the professional divers or the persons that dive in great depths. As the scuba dive is done in shallow waters with fewer currents, buddy separation never happens. Though you might feel that you have gone to great depths under the water, the scuba diving for tourists is done at very fewer depths. Further, the guides are trained to rescue any person from any situation such as loss of nasal and eye mask; dropping of oxygen pipe; feeling pressure in head or ears, and the shortage of breath etc. They are trained to bring any drowning person to the surface in 3 or 4 seconds by diving straight upwards. As the guide is always holding you, you are always safe. The guide will always ensure that you don't touch or step into something that can harm you. Now, let us have a look at the statistics of the deaths caused by scuba diving. This will give you an idea about the safety of scuba diving in Kerala. As per the data available online, the number of deaths caused by scuba is lesser than the deaths caused in childbirths; deaths caused by bowling; deaths caused by volleyball; deaths caused by snowboarding and even fishing. Hence; one can easily conclude that scuba diving is really safe; safer than even fishing. Though, one cannot say that one can NEVER EVER die while scuba diving. ; but it is true that Scuba diving is one of the safest water sports in Kerala as well as in India. The reasons that lead to deaths (reported around the world) owing to scuba are very rare such as buddy separation, cave diving, medically unfit persons, diving in great depths for which you are not trained and accidents with buoyancy inflator. All of them are relevant to the professional divers or divers that dive in great depths. Tourists are taken into shallow waters with fewer currents and are always monitored by the guide; hence the risk of fatality is nearly zero. So, what are you waiting for? Gear up and dive into the lovely blues to find what forms the underwater world and have an adventure of a lifetime.